When we think of war, we generally think of soldiers. In World War I, we imagine them in the trenches, drowning in mud and the immense suffering of those who were exposed to lethal gasses. What I don't think about as much is those who eased the suffering of these soldiers. Women who weren't even particularly welcome, sometimes at all, at the front, who risked their lives to work in field hospitals, dressing stations and the countless other hospitals that saw to the unthinkable numbers of wounded.This book tells the story of the nurses who left their comfortable homes in Australia and New Zealand and fought in a war. Fought with the same amount of courage as any other soldier. Maybe they weren't holding a gun but they were tending to wounded on the same ships that were getting torpedoed and they drowned just like any other soldier. They tended to the wounded in hospitals that got shelled and they were killed like any other soldier. They caught the Spanish flu, got shell shock and they had to don their gas masks when the gasses reached them. They lived in horrendous conditions and had to work under duress just like any other soldier. Of course, they witnessed a horror and carnage that I can't even comprehend. Women spent actual YEARS of their lives focused on the care of "their boys." And of course it wasn't ALL completely horrible. People flirted and fell in love. Especially at the beginning of the war, there was time for exploring and sightseeing between battles and nearly all nurses saw the world for the first time. I learned a little about Australian politics and a lot about the war. Some sections moved a little slower than others but I thought that more factual history was tied in very nicely with diary entries and the personal experiences of specific nurses. It has certainly given me a much great appreciation for nursing and the role that they played for those in their care.War is horrible. Actually and completely horrible. The numbers of lives lost in The Great War makes me feel physically ill. I think this book is important because it puts a human face on the numbers we can't even comprehend. The Other Anzacs by Peter Rees offers the reader the chance to delve into the lives of those mostly forgotten heroes of the First Australian Imperial Force (AIF). This is the story of those forgotten heroines; the nurses from Australia and New Zealand who volunteered to follow our soldiers into the Great War and provide nursing support under some of the harshest conditions imaginable.Most served on the Western Front and a number lost their lives looking after wounded Allied soldiers. This is a great book, easy to read, well researched and nicely presented. The book is full of interesting facts and touching first-hand accounts. I found the book a pleasure to read and I learnt for the first time of the sacrifices made by these marvellous nurses, which I think more people should know about. I read this book to compliment the ABC Television series the ANZAC Girls, which this book is based on. 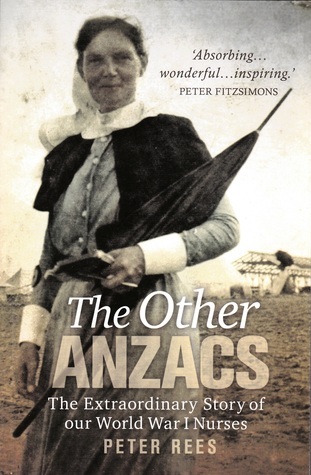 I found this book a fine accompaniment to the Television series but also a comprehensive history of the forgotten heroines of the ANZAC legend, the hardworking nurses who served in the Great War. This book combines well an array of sources such as diary entries, personal letters, official documents, a collection of photographs and firsthand accounts of the nurses. At times, the accounts are extremely moving, the nurses faced unimaginable horrors while working in harsh conditions such as hastily erected hospital camps, tent surgeries and ill equipped hospital ships. Counteracting these horrors of the battlefield, are tales of mateship and love, these are the parts which I enjoyed reading the most. This is a well researched book that does a good job of opening the reader’s eyes to the sacrifices made by these courageous women. This book took me a little while to get in to, as it's a bit dry at the beginning, with all the footnotes and quotes punctuating the story. But once I got used to it I found it very interesting. The strength of these women was amazing. The death and destruction they must have seen during the war seems incomprehensible but the book gives you a good idea of the horrors of war. Incredibly powerful book. I've seen a couple of reviews of the TV miniseries and would recommend reading the book instead. I really found this book both informative and entertaining, the deeds that these girls performed was both inspiring and courageous under trying circumstances. This book really give a really good look at what they endured, plus what they achieved in equal measure. I recommend this book highly!! Reading this book really opened my eyes to the remarkable, nay astonishing, feats of endurance and achievement of our nurses during wartime. These women didn't have to go to war, they weren't given white feathers, or anything like that. They wanted to go and look after 'our boys'. And what a job they did under truly hellish conditions that are part and parcel of that first horrible global conflict. They went, they suffered, they endured, they did marvellous work that did all us Aussies and New Zealanders proud. They all deserved medals, but decorated or no, this book will ensure that, once read, these women will never be forgotten. After falling in love with the mini series this book became a must read for me. At first I thought that the book wasn't for me and was going to be a bit boring. I was wrong. Rees narrates the horrific and factual events of war whilst weaving in the diary entries of countless nurses who served in various parts of the world. Their struggle is real in every page of the book and it becomes clear that the diggers are not the only ones responsible for forming the Australian identity. I now appreciate their sacrafice even more so and I hope that if I lived during this time of history I would have had their strength and courage. A must read for any Australian. I loved this book although I had already seen the mini series on tv. Parts of it were very sad especially those that drowned while waiting 12 hours to be rescued after the ship was torpedoed. I think it was very realistic and brought home to us living in the 21st century the things that they went without during the time of this war. Based on letters and journals of women who served as nurses in WW1, and source for the recent TV series of the same name. I was surprised to learn that much of the action and romance of the TV version was true to life! Love the miniseries and the book supports the miniseries by providing more background and depth. Because of this book and the mini series based on this book I now appreciate what these amazing heroic woman did. Without doubt one of the best books ever read. These women really were the unsung heroes of World War I. The things they endured and wrote about were hard to read at times but I am so glad I did. Well written and researched. Even though this is about the nurses of a certain region or army-The Australian and New Zealand Army Corps-it can be said that what they experienced can be said to have been experienced by nurses in other Allied armies. This book follows a number of ANZAC nurses and relates what they experienced during and after their time in service. Some of what they experienced was absolutely horrendous which I will not give here. You'll have to read the book to find that out for yourself. Be that as it may if you want to know what it was like for those ANZAC nurses to have experienced, or for any WW1 nurse for that matter, then this book is definitely a must read. I couldn't put it down. Enjoyed this book far more than the TV series, which was pretty air-brushed when it came to the reality of life on the frontline during WW!. Rees does an excellent job of recreating the people, their tasks and the social and political milieu in which they operated. I hope that the stories of the Anzac women get more and more attention. A great book about some extraordinary women, who now won't be forgotten because of Peter Rees. This should be on everybody's reading list, but most certainly if you are an Australian or New Zealander.Can't recommend it highly enough and the amount of research that has gone into this book is commendable and sadly lacking in many books these days. This incredible journey and experiences were so interesting - but the story is told in a very academic way which made it a hard slog. The TV series felt like it gave more of a sense of the actual characters of these women. A little dry in places, but a fascinating insight into how Australian and New Zealand women suffered, triumphed and endured during WWI. I was never a particularly good student of history when it came to dealing with wars. Trying to sort out when, where and why was something I couldn't seem to get my head around. Then I realised it was because it dealt with the bigger picture. I started reading this book because my two grandfathers and a couple of great uncles were involved in WW1 and I wanted to get a better idea of the impact on their lives and of others like them. Put together from a series of letters and diary entries, this book originally seemed to be rather piecemeal, but gradually a story began to emerge. What struck me most were the appalling conditions under which the soldiers fought and the nurses worked, the emotional toll on their lives, the incompetence of some of those in command and the sheer courage of both troops and nurses, especially from Australia and NZ. Another important issue was the shoddy treatment of the nurses on their return by these governments in lack of the recognition and benefits awarded to the troops. The nurses may not have been involved in the fighting, but they were shelled at Casualty Clearing Stations, drowned when torpedoed at sea and many were also lost to illness. It may be too late for the benefits, but this book goes a long way to redress the issue of recognition. Extraordinary was right for this book. The nurses started off in Cairo. There was fun there, dancing, dining flirting with the soldiers who were waiting to find out where they would be sent. Many of the soldiers contracted VD due to use of local prostitutes. All this while somewhere war was raging.Then reality. These girls saw horror than no one should ever have to face. Men who they had known in Cairo coming into the hospitals which had little or no surgical items required. Men with no limbs,burned, blinded. Hundreds of dead. Bombs falling near the hospitals, nurses killed. A ship carrying both troops and medical staff torpedoed, hundreds dead or maimed.To make matters worse Spanish Flu hit both army and nursing staff, more dead.Horrific tale which should never happen again, but it did, the second world war came only about 30 years later. Some of the nurses now lost children or grandchildren in this war. And still we send our men to fight futile wars. This book makes you think, will we ever learn? After watching the ABC series with the same name, I was interested to learn more about what was discussed in the tv series, so I picked up this book. War books on the whole can be very dry with details, and it's a strong contrast when comparing to the beautifully executed series. The flow of narrative that stemmed from the show is a little lost here, and although it makes sense to follow the war through consecutive dates, it makes it hard to grasp onto the characters being discussed when you are piecing them together from bits and pieces throughout the book. However the real life journal entries from the nurses provides a string of truth throughout the book that provides you an intimate understanding of their hardships, and it is this honesty that makes the book worthwhile. A poignant read for anyone interested n Australian history, or wanting to learn more about women in war. If you're looking for a more in depth character understanding ,the series would be your better option. I read this book in connection with an exhibition we were hosting at the Tin Palace to mark the centenary of the outbreak of the First World War. The chapter on the sinking of the troop ship the Marquette and the loss of NZ nurses onboard was excellent background reading, so much so that I bought the book to read. The Other Anzacs highlights the experience of NZ and Aussie nurses through their own words - from letters, diaries, photographs and is supplemented by additional research and information. Peter Rees highlights the personal and professional struggles that the nurses faces as well as noting the differences between the abilities of antipodean and British nurses.It is testament to the quality of the research and writing here that this appears to be the source of the fictional "Daughters of Mars" by Thomas Keneally and the TV drama, "The Anzac Girls". At first i found this book hard to get into, reading about the war is alot different to watching the tv show, but once i got past the fact that nursing in the war was a gory business i really enjoyed this collection of stories. It seemed to capture the spirit of nursing and love, it also made the reader feel like although the nurses seen heartache, death and dying everyday, there were Sisters such as Alice Ross King which made a difference to many a soilders lives. I did enjoy the fact that the stories of nurses were followed through until the very end of the war, it gave the reader a sense of a happy ending and finished off the book well. Im very glad that i stuck the book through until the end and in the next few days will be rewatching the mini series. Peter Rees did a beautiful collection of stories and should be commended. This is a really informative, astounding history of the nurses who served in the Australian and New Zealand armies during the Great War. It is comprised mainly of diary entries and author narration but also includes letters, official documents. There are a fair few pages of photographs too, which were really informative. I found it to be a really good read, as a student nurse wanting to learn more about different fields of nursing through history. I am in awe of the almost superhuman feats of the nurses and other medical staff. They faced such horrific conditions and tragedy around them every single day. Their contribution to the war should never be forgotten or underestimated as it has been in the past. There was a lot of information and detail and it was not an easy book to read with so much suffering. However, it was certainly important to record this and to acknowledge the work of Australian and New Zealand nurses in World War One. It shows how much danger they faced and how courageous they were. It must have been so hard to come back from the war, especially for those who lost their sweetheart or who did not have anyone to talk to who had been through the experience.Financially it would have been hard for single nurses who were not eligible for a war home loan. It does show how far women have progressed towards independence in a hundred years. A wonderful non-fiction book providing much insight into the lives of the female nurses through WW1 at Gallipoli, France and other areas. At one point the chapter was referring to a soldier who was talked about by one of the nurses and I suddenly realized that it was my Great Uncle who had died in the war! That really brought it home on a very personal level. It brings a greater understanding of the horrors these nurses faced each time a new round of wounded came in and the horrific nature of war itself. Definitely worth a read. A very detailed account of the mostly Aust & NZ nurses who served overseas during WW1. I've read numerous accounts of this time, diaries of those who served and so on, and found this less absorbing than I would have had I not had previous knowledge. Well written, just didn't grab me. And unlike other reviewers who enjoyed the romantic angle I found it annoying. Think I've read enough of these times. I do recommend "Just wanted to be there: Australian service nurses 1899-1999" as a much shorter but very interesting book. Piecing together the excerpts of nurses diaries as they describe their war experiences, you truly feel the horror and futility of war in this book. You cannot help but admire the courage of these women as they care for the sick, fall in love and lose friends and lovers to war. Many of the diary entries are beautifully written with poignant descriptions not just of their injured charges but the beauty of the countryside, in stark contrast to the horror of their work. A beautiful tribute to heroic women at a time when there was little recognition for what women could accomplish. beautiful, well written book which educated me on something I didn't know a great deal about. These brave, strong beautiful women are such heroes in the challenges they faced, the loves they lost and especially putting themselves at risk. the section that moves me the most was the sinking of the transport ship as it proves that a lot of the time especially in wartime errors of judgement can prove to be especially costly in terms of human lives. a book everyone should read. Peter Rees - Peter Rees was a journalist for more than forty years, working as federal political correspondent for the Melbourne Sun, the West Australian and the Sunday Telegraph. He is the author of The Boy from Boree Creek: The Tim Fischer Story (2001), Tim Fischer's Outback Heroes (2002), Killing Juanita: a true story of murder and corruption (2004), and The Other Anzacs: The Extraordinary story of our World War I Nurses (2008 and 2009) and Desert Boy: Australians at War from Beersheba to Tobruk to El Alamein (2011 and 2012). He is currently working on a biography of Charles Bean to be published in 2015.